Scotch broom is a perennial shrub species in the pea family (Fabaceae) that originates in central and southern Europe and northern Asia. It was introduced to the east coast of the United States in the 1800's (National Invasive Species Information Centre 2010, Global Invasive Species Database 2011) and is now found in several eastern and western states (AK, AL, CA, CT, DC, DE, GA, HI, ID, KY, MA, MD, ME, MI, MT, NC, NH, NJ, NY, OH, OR, PA, SC, TN, UT, VA, WA, WV) and in Canada (BC, NS, PEI) (USDA 2010). This is a significant invasive species. The first BC collection record for Scotch broom in the UBC herbarium is from 1905, when it was collected by Edith M. Farr from Victoria on Vancouver Island. Today is it widespread on Vancouver Island and the adjacent Lower Mainland. It also found in the Queen Charlotte Islands and in the southern interior. This species shows preference for dry sandy soils in full sun, with a soil Ph of 4.5 to 7.5 (Global Invasive Species Database 2010). It reaches heights of 1-3 (4) m, shading out understorey species. Seeds spread most quickly via water, and along roadways (Global Invasive Species Database 2011). While the peak flowering period for this species is May/early June, flowers have been observed on plants as early as February and as late as December in the Vancouver area. Medium to tall shrub, up to 3 m tall; stems usually erect, branched; twigs strongly 5-angled, green, somewhat hairy when young, becoming glabrous. Alternate, deciduous, on lower or older branches stalked and palmately compound with 3 leaflets, on upper branches unstalked and simple, pressed close to the stems; leaflets egg-shaped to oblong, pointed at the tip, hairy when young but soon glabrous, 5-20 mm long; stipules lacking. Inflorescence of solitary or sometimes 2 or 3 pea-like flowers borne in a leaf axil; corollas yellow, sometimes purple-tinged or two-toned yellow and red, about 2 cm long; calyces hairless, 1/2 the length of the corollas, 2-lipped, the upper lip 2-toothed, the lower 3-toothed; styles coiled, longer than the keel. Pods, black, flattened, 2.5-4 cm long, glabrous except along the long-hairy margins; mature pods split open and spiral as they dry, ejecting the 5 to 12 seeds. Mesic to dry fields, rocky slopes, roadsides and powerline rights-of-way in the lowland and lower montane zones; locally common in SW BC west of the Coast-Cascade Mountains, infrequent on the E Queen Charlotte Islands, rare in SC BC; introduced from Europe. This species is listed by the Greater Vancouver Invasive Plant Council one of the twelve most problematic species in the Vancouver region. For further information about control of broom, visit their web site. It is also listed as one of the top fourteen species of concern by the Coastal Invasive Plant Committee. Visit their web site. Scotch broom is an aggressive invasive species. Control is difficult, and ranges from hand cutting of shrubs to use of biological control agents. Some researchers have found that cutting broom at the end of the dry season can decrease resprouting rates (Bossard and Rejmanek 1994). Other researchers have found that seed bank germination is highest in disturbed sites, and in Europe is correlated with March rainfall, both factors that could influence management actions (Paynter et al. 1998). Seedling survival is positively correlated with disturbance (Paynter et al. 1998), although seedling mortality rates vary from region to region (e.g. Europe versus Australia) (Shephard et al. 2002). A high percentage of broom seeds (greater than 65%) have been found to be impervious in some studies, which can delay germination from months to years, contributing to the seed bank (Bossard 1993). First flowers appear in the lower Fraser Delta in late March-early April. A shade-intolerant, submontane to montane, European deciduous shrub introduced to Pacific and Atlantic North America. Occurs in maritime to submaritime summer-dry cool meso thermal climates on very dry to moderately dry, nitrogen-medium soils. Its occurrence decreases with increasing latitude, elevation, and continentality. Inhabits exposed mineral soil in early­seral, non-forested communities on strongly drained, water-shedding sites. Symbiotic with nitrogen-fixing organisms. Characteristic of disturbed sites. Bossard, C. C. 1993. Seed germination in the exotic shrub Cytisus scoparius (Scotch broom) in California. Madroño 40:47–61. Bossard, C. C. and M. Rejmanek. 1994. Herbivory, growth, seed production, and resprouting of an exotic invasive shrub Cytisus scoparius. Biological Conservation 67 (3): 193-200. Paynter, Quentin, Simon V. Fowler, Jane Memmott, and Andrew W. Sheppard. 1998. 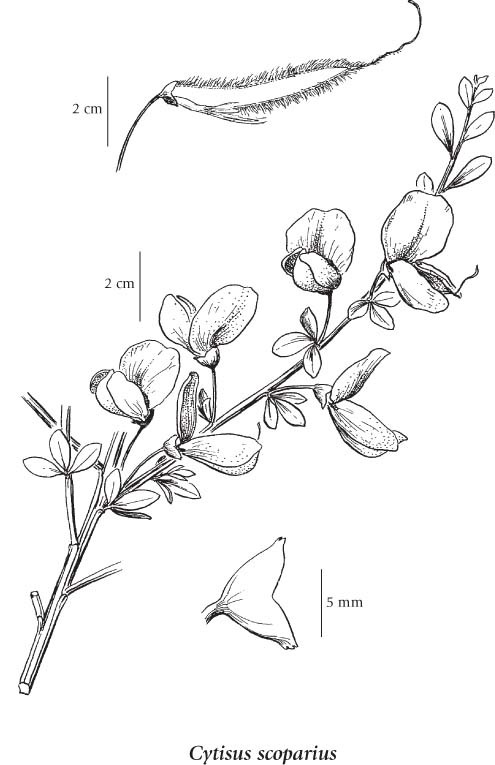 Factors affecting establishment in southern France of Cytisus scoparius implications for managing for native and exotic populations. Journal of Applied Ecology 35: 582-595. Sheppard, Andrew W., Peter Hodge, Quentin Paynter and Mark Rees. 2002. 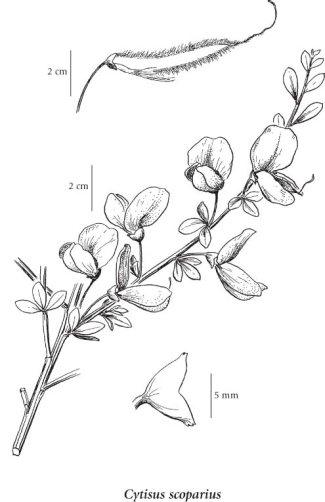 Factors affecting invasion and persistence of broom Cytisus scoparius in Australia. Journal of Applied Ecology 39: 721-734.